Here’s the first installment of our food adventures in Italy. Hope you enjoy it! And if you too, come on back for more very soon. Is there anything better than the smell of freshly baked bread? First thing in the morning here, as you pass each bakery, the smell of freshly baked bread and sweets wafts through the air. I swear it’s a way better wake-up call than a rooster. A new “pub” opened up around the corner from my grandmother’s house over the summer. It’s a place that seems to have a story. Gianni, who was serving, appeared to be doing some of the food prep, and was also the owner, seemed like a man with a past. It’s the kind of place you only hear about by word of mouth, but attracts a loyal clientele. My cousin’s family chose the locale, so we could walk home after sampling the region’s best vino. There’s no menu per se, just a couple of selections for each course depending on what’s fresh. We started with a simple appetizer of cured meats and aged cheese alongside a basket of fresh bread. 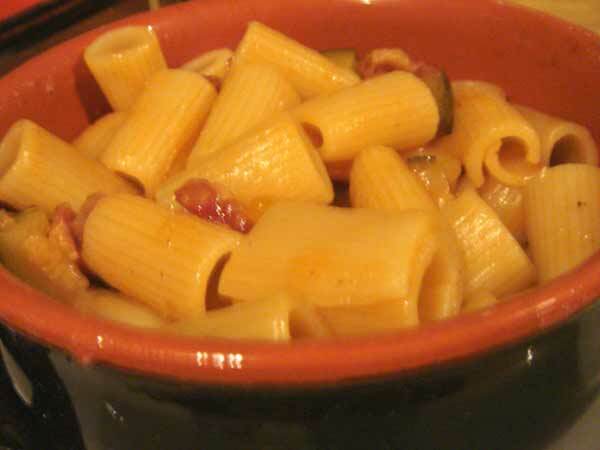 The first course was a choice between penne with zucchini and sausage in a fresh tomato sauce or a bean soup full of Romano beans, lentils and barley. They were both delicious, both hearty and fresh. Our second course was “spezzatino,” chunks of beef with peas in a hearty broth. It was accompanied by a big bowl of tomato and basil salad was served family style for the whole table. Plus there was some fried Scamorza cheese that melted in your mouth. The meal was accompanied by two delicious bottles of wine, my favourite though was a regional delicacy called “Testarossa” (yes, like the Ferrari). The food was delicious, the locale was a lovely open air terrace, the weather was cool and clear and the company couldn’t have been better. It had all the trademarks of a meal to remember for a lifetime. We bought our first gelato at a little place in the main square of a town called Avezzano. I ordered a cone with chocolate and bacio (a hazelnut chocolate flavour), and the server suggested some whipped cream. I was in heaven. We opted for gelato instead of lunch and I think it was the right call. It turned out it would set a pattern for the rest of our trip. Later we decided to stay in for dinner. I made a quick tomato sauce with sausages on spaghetti. I don’t know if it was the sausages we picked up from the butcher that afternoon or the freshly grated parmesan cheese, but it was pretty good if I do say so myself. Maybe it’s the mountain air, but everything just seems to ‘pop’ a little bit more in Italy. I guess it could be the excitement of being on vacation, but whatever it is, I’ll take it. Big meal number two. 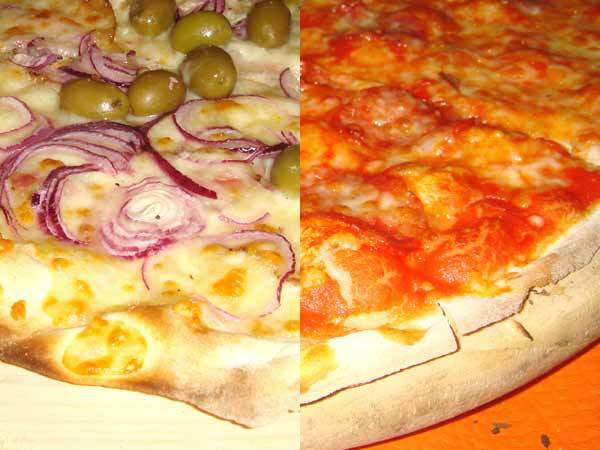 Osteria Perrotta, a local pizzeria with a smokin’ hot wood-fired oven. We started with a mixed antipasto, a platter with cheese, salami, prosciutto, melon, grilled veggies, potato dumplings, rice dumplings and a frittata (a type of omelette) with truffle. That followed by individual pizza, “Al Diavolo” (Devil’s style) for hubby and “Ne ‘nente” (slang for it’s nothing) for me. The former had tomato sauce, mozzarella, spicy salami and aged cheese. The latter was a white pizza with pancetta (cured bacon), green olives, mozzarella and onion. It ‘s like I forgot how sweet onions can be. If they’d rolled the dough any thinner it would have been like paper. I love a crispy, wafer-thin crust with fun and flavourful toppings. And it went down even easier alongside a cool blonde…beer, that is. A friend met us at the airport in Rome to help guide us, and the rental car, out to the small town where my dad grew up. About an hour’s drive later we had arrived at his home, where lunch had been kept warm for us, despite the fact that it was nearly 5pm. (Of course in Italy, lunch, the biggest meal of the day is usually served around 2-3pm, and dinner around 9pm, so it was far too early for dinner.) More on that later. We sat down to an amazing plate of homemade fettuccine in fresh tomato sauce with just a sprinkle of grated truffle on top. That was quickly followed by meatballs cooked in the sauce and stewed beef, plus golden potatoes done in fresh tomato. We insisted on skipping the salad, so two kinds of cheese and bread appeared. One was a fabulous, tangy, aged sheep and cow’s milk cheese. I’d share the name with you, but it doesn’t exist, it’s just cheese made by somebody locally and sold at the weekly market. Immediately afterwards, several kinds of fruit from the backyard appeared, including peaches and melons grown just outside the window where we were sitting. Dessert was a light ice cream cake coupled with a quick espresso. So for a first meal that was supposed to be no big deal, it ended up being a way to kick off this trip in style. So I just got through all your Italy posts! I’m pretty sure if I spend more than a week with family over there I’ll be back heavier than ever haha – kutos to you both for not gaining more than you did ;). It’s weird though that Italians (real ones) aren’t fatter than they are… in fact for the most part they appear in great shape and great health… at least infinitely better than North Americans… we’re missing something. One day I hope to spend an extended period of time outside North America and I’ll let you know what I discover. Meanwhile my comment for the posts is just a question about the first restaurant you ate at when you arrived – the meal sounded amazing and you indicated it was “kept warm” for you both upon arrival – where was that? It was at our friend Simplicio’s place, where his wife kept it all warm for us until we arrived. We kept updating her on the road from the airport in Rome with our ETA. Maybe if you’re eating well you can write some guest posts for this blog!